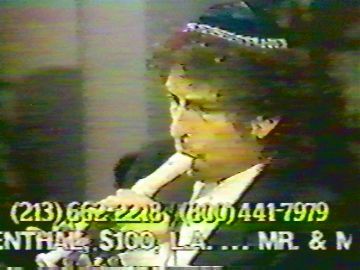 I can’t find any video of this online, nor even the audio, so you’re going to have to trust me when I say that Bob Dylan’s most bizarre concert appearance (so far) occurred on September 24, 1989 on the L’Chaim to Life! Telethon in support of Chabad. Sparking rumours that he’d moved on from being a born-again Christian to becoming a Hasidic Jew, Dylan appeared on-stage with singer/songrwriter Peter Himmelman and actor Harry Dean Stanton (who had a bit part in Renaldo and Clara). During the three song set Dylan played the flute and the recorder. Yes, you read that correctly. The trio performed somewhat amateurish versions of “Einsleipt Mein Kind Dein Eigalach”, “Adelita” and “Hava Negilah”. The whole thing lasted about ten minutes. I have no idea how much money they helped to raise. Dylan appears on the front page of the Telethon’s homepage with a testimonial alongside Al Gore, Conan O’Brien, and Jeniffer Aniston. Given that the first of these telethons was hosted by Carrol O’Connor, not a noted Hasidic Jew, I’m not sure why people would have assumed that Dylan had converted instead just assuming that he felt that the organization did great work for humanitarian causes, other than the fact that people assume a lot of things about Dylan. I’d love to be able to link to this material, but it is almost exactly how you would imagine Dylan playing the flute would sound. He is not a gifted flutist.